The Silk Road was an ancient trade route across much of Asia and Europe and was an important aspect of many different historical periods and events, including: the Middle Ages, the Renaissance and the Black Death. It is perhaps one of the earliest and largest trade networks in human history, and played a vital role to many different civilizations throughout Eurasia from approximately 120 BCE to 1450 CE. Named by historians for its trade of goods including silk, the Silk Road actually emerged out of earlier trade networks that date back to the time of the Roman Empire. At its height, the Silk Road stretched from Japan and China in the east to the Mediterranean area including Italy in the west, which was a span of over 4000 miles. Along the way it travelled through many different regions including: India, Persia, the Middle East, Africa and Eastern Europe. Much of the trade routes of the Silk Road were on land, but there were also several key parts of the route that used merchant ships, such as in the Indian Ocean, Black Sea and Mediterranean Sea. The land routes were vast and extended over many different types of terrain. For example, it crossed through deserts, over mountain ranges and through tropical areas. As such, most traders only travelled between small sections of the Silk Road, meaning that goods changed many hands before arriving at their final destination. Most travel along the Silk Road occurred in the form of caravans, with the camel being the desired animal of choice. Due to its ability to handle vast distances and difficult terrain, the camel was ideal for the job. Traders often travelled in large caravans in an attempt to withstand raiders who might seek to steal the goods from the caravan. There were many different civilizations that participated in the Silk Road over the centuries of its existence. Obviously, Chinese and Mongol traders played an important role in the Silk Road, as many of their goods were highly desired in faraway markets, such as Europe. 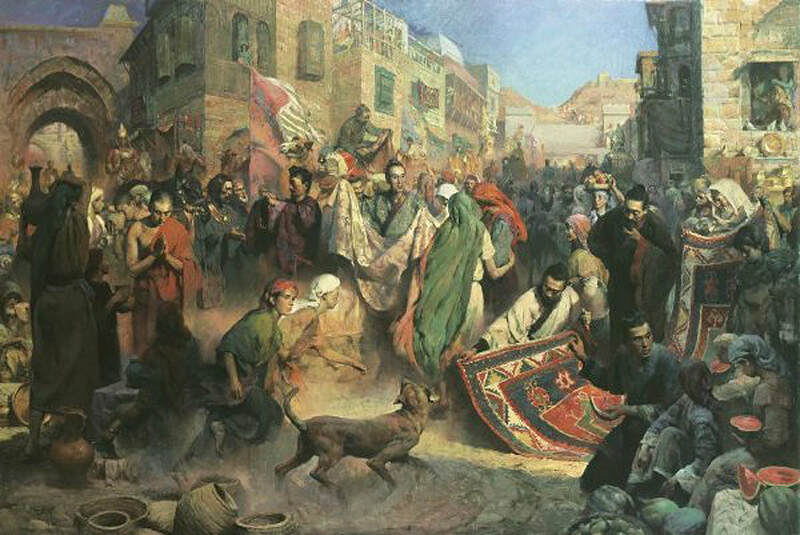 Therefore, European traders often travelled to areas in the Middle East to secure rare and desirable products, from the far East. For their part, the traders of the Middle Eastern civilization were essentially the middle men who traded goods from both sides. This situation greatly benefitted the Middle Eastern societies in several different ways. First, it meant they had access to a wide range of good from both Asia and Europe. Second, it allowed them to gain knowledge from across the continent, which led to the Middle East becoming one of the centers of learning in the time period of the Middle Ages. Third, the Middle Eastern civilizations amassed massive fortunes as they benefited from the main routes of the Silk Road travelling through their territory. 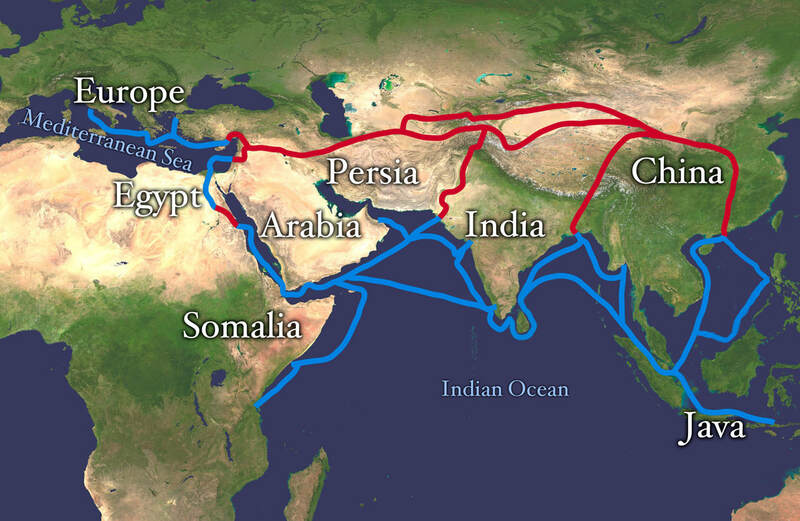 As stated previously, the Silk Road saw trade occur in both directions and involved some key goods. For example, merchants and traders in the East transported to Europe, goods such as: silks, glass-based products, paper, spices, apples, oranges, and other foods items. On the other hand, other goods moved to the east (towards China), such as: grapes, cotton, gold, silver, wool, etc. In general, the most popular items that were traded along the Silk Road were food items and luxury items. This means that the goods shipped along the trade routes were not necessary for most people but instead, improved people’s quality of life. While the Silk Road is generally remembered for the food and goods that were traded along the route, it is important to understand that the Silk Road also involved the exchange of ideas and diseases. As mentioned earlier, the Middle Eastern civilizations became major centers of learning and knowledge during this timeframe. For example, mathematicians from the Middle East used knowledge from eastern areas such as India to refine and improve mathematics, including methods that are still used today. Furthermore, religious and philosophical beliefs from the time period spread easily along the routes and had a profound impact on later events such as the Renaissance. For instance, after the Islamic faith originated in the Arabian Peninsula in the 7th century it quickly spread throughout the Middle East, Africa and even into parts of Europe, as traders brought their faith with them on the Silk Road. As for diseases, the bubonic plague famously spread across Asia and eventually into Europe in the 14th century along the major routes of the Silk Road. In fact, the first reported instance of the Black Death in Europe dates from 1347 when Genoese traders arrived in Sicily after having returned from the Black Sea. The Black Death had a profound impact on Europe and Asia and likely led to the deaths of half of the people alive at that time. 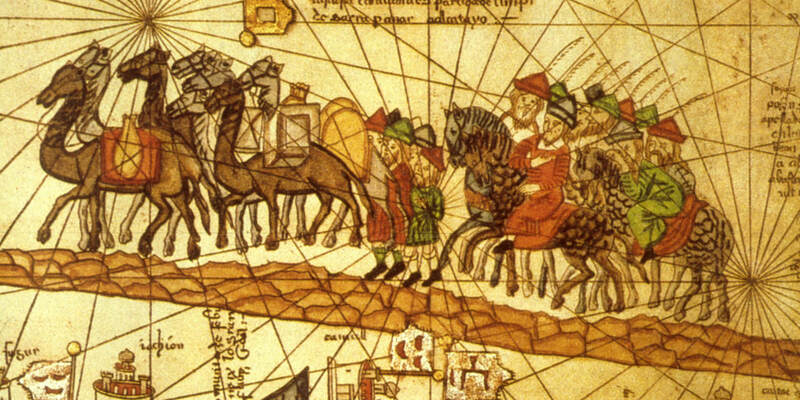 In all, the Silk Road was an important and early example of an international trade network. Its routes traveled through many different modern countries and had a lasting effect on several different regions. For example, the knowledge and religious traditions spread along the Silk Road led to the Renaissance, while the Black Death led to millions of deaths.